Your tow vendor’s workers compensation insurance matters to you. Here’s why. Let’s say that you operate a small repair shop. Your customers call you to set up service appointments, and sometimes, it’s necessary to dispatch a tow truck to get the vehicle and bring it to your shop. So you call a tow company, and let’s assume that they meet with your customer, retrieve the customer’s car, and deliver it to your shop. You pay the tow bill, and add it to your customer’s repair invoice. Everyone’s happy, right? Not so fast. Here’s why your vendor’s worker’s compensation insurance matters to your bottom line. What if the tow operator accidentally smashes a hand or foot while unloading at your shop, requiring reconstructive surgery? What if the unthinkable happens, and the car he’s unloading rolls over him and results in a fatal injury to the tow operator? Well, if the towing company provides worker’s compensation insurance for their employees, then it’s covered, even if the accident happens while on your property. 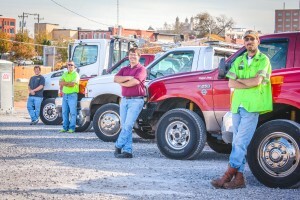 Some tow companies choose to keep costs down by calling their tow truck operators “independent contractors”. By doing this, they avoid the cost of payroll taxes and worker’s compensation coverage. Any reputable tow company will be happy to provide you with a copy of their work comp certificate on request. Ask your tow provider TODAY about their worker’s compensation coverage, especially if their rates for towing seem like a really cheap deal. Worker’s compensation not only serves to protect employees of your tow vendor, it also can protect your liability. Wouldn’t you rather do business with a company who abides by the law and takes care of their employees? Oklahoma Towing & Recovery has fair rates. We don’t claim to be the cheapest, but we do what we can to ethically and legally keep your costs reasonable. We provide the right coverage, at considerable expense, to make sure that your customers and your business’s interests are protected. Call us today so that we can show you what ethical and professional service can mean to your image, your customers, and to your bottom line.